Stacia flew out for Anchorage early on the 12th. Alaska Airlines was amazing! They arranged for her to be escorted, fly at better times and it only cost me $60. They gave me a complete refund on my ticket, so that I could book my return flight whenever it was time for me to fly home. The afternoon of December 12th, with family around her bed....mom simply stopped breathing. Those in the room began to leave and Will and I were at the hospital, talking to funeral homes and care teams about what to do next. I sat beside mom and reflected on all she'd been through which brought her to this point. Several from the church came to visit and didn't know she had passed away. The support of the church is amazing. We texted family who wasn't here. I called Michael and they were on their way home from the airport after picking up Stacia. We began to get texts and phone messages...."I went to Dairy Queen and remembered Grandma." "We stopped at DQ and had ice cream in Grandma's memory." And us in Oregon....we went to Sharis and had THICK chocolate shakes with fries - in mom's memory....One of the shared memories Mom and I found funny had to do with her love of fries and ice cream. She was visiting us in CA. 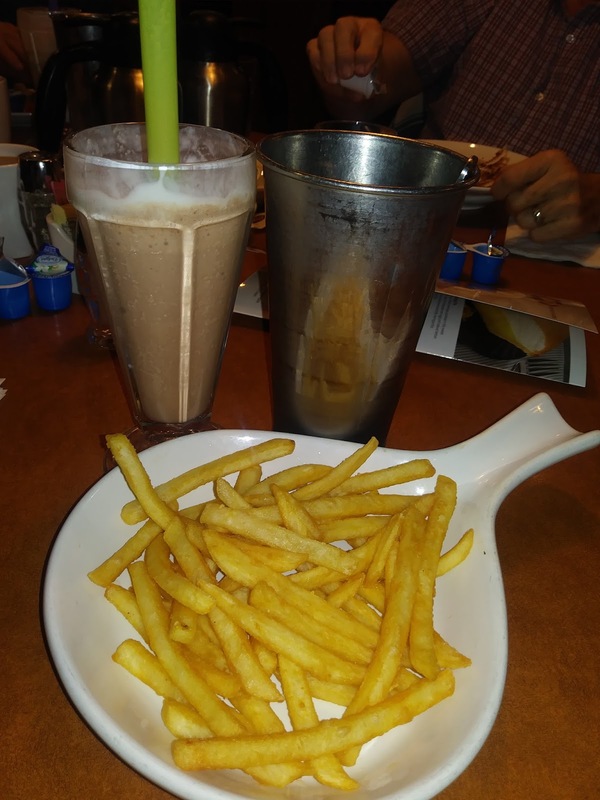 I had taken all out to eat, the kids ordered, Dad ordered, Mom went to order.....She asked for fries and "an extra thick chocolate shake." Without thinking, I exclaimed, "No, you can't have ice cream with lunch!" She was flabbergasted, "What? Did you just say I can't have ice cream?" "Yes, I did. If you have it all the kids will want it, and I'm paying so no ice cream." She found it hilarious and brought it up often - even texting one of the grandsons to say, "Do you know what Aunt De'Etta just did?" It was funny in Virginia, Alaska, and Oregon we were all tied together, doing the same thing, for the same reason. Here I am - the last post about this season in our life. There's the advance directive thing, and a new understanding of Ps 116. It was confirmed for me death is sacred and holy - closer than we often think. It seems there is just a curtain between us and heaven, and when it's time, God simply pulls the curtain aside and we step over. Many, MANY, emailed, called and said Mom was one of the few that "loved me just as I was." I want to live my life as one who loves others, out in the open, just as they are. The outpouring of love was amazing. I honestly, don't believe Mom realized how much she was loved. I want to deal with my past hurts, so I can fully accept the love others give me. In the end, eating too much sugar, really didn't matter! I will continue to pursue good health and follow the eating plan laid out by my doctor, but I am hyper aware when it is time - it is simply time. Mom was a charger. Always. She went full bore into the things to which she committed. It seems to me this is good. I know she felt there were things she left undone - but if she hadn't been a charger there would have been more. On the other hand, Mom was not afraid of solitude and NOT doing everything that was expected of her. I will prayerfully consider where I choose to invest my time. A heart to share Jesus is good - and He will find a way to honor our heart even when we can't vocalize the Roman road. Family is important. Treasure each moment with them - but learn to hold them with open hands. Keep pursuing new experiences and new activities. We'll grow old if we stop playing. Sometimes a girl needs a thick chocolate milk shake - and that's o.k. There are many more, but these are the ones which come readily to mind. I find, as I process the "What If's," I continue to learn from Mom's life. I'm relieved to be done blogging about this season in our lives. For now.